After reading Steph Weber’s post about session beer, I started to think about what beers I like that would qualify as “session”. I blog a lot about my love of high ABV brews, but at the end of the day, these aren’t beers you can drink pints of without taste bud overkill or an extreme hangover the next day. That’s where Franziskaner comes in. There may be some people who discount Franziskaner as “good beer” based solely on the fact that it’s made by Spaten, a “macrobrewer” of sorts. I may have even discounted some beers in the past because of this, but I’ve had an epiphany: not all macrobrewers make crap beer. 🙂 So Spaten “Darth Vader” Daddy aside, here are my thoughts on Franziskaner and why it makes a good session beer. 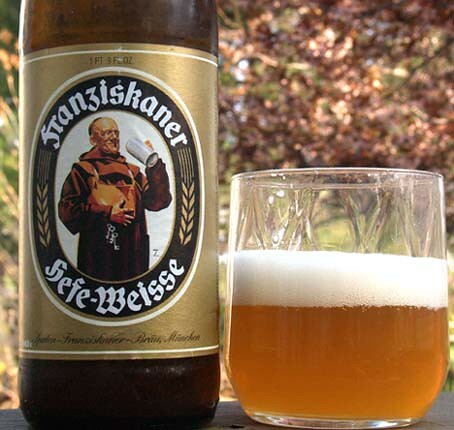 Franziskaner is a hefeweizen or wheat beer that is brewed with a high proportion of (you guessed it!) wheat! This German style of beer has been popular for as long as I’ve been legal to drink and is often served with a piece of citrus. Whether it’s required or not, this beer is good even without a lemon or orange in it. Its appearance is a beautiful honey color and is a bit cloudy (normal for hefeweizens) with a decent head that drops as you drink it. It has a distinct smell of cloves and citrus and the taste is refreshing…with flavors of spices (there’s that clove! ), fruit and wheat. There is practically no flavor of hops in this beer, so for those of you who don’t like hoppy beers, Franziskaner (and most wheat beers) would be a good choice. This is my perfect hot weather beer although I can drink it year round. The carbonation is light and mild and it feels smooth going down. And at only 5.0% ABV, I can drink more than one and not worry about getting drunk after a couple. Four pints out of five on Franziskaner. With the weather warming up, why not have one! Note to SF’ers: Mollie Stones had it on sale this past weekend for $6.99/six-pack. What’s your session beer of choice? This entry was posted in Beers and tagged hefeweizen, session beer by Melanie. Bookmark the permalink. Strangely enough, I've never had this one before yet I see it everywhere. I'll have to divert away from the IPA and give this a shot!